Vice President Dr Mahamudu Bawumia says the United Nations Office of Project Services (UNOPS) 100,000 affordable housing project that is set to commence in the country soon will be a game-changer. 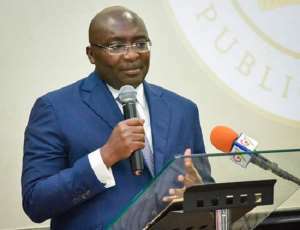 Government and UNOPS are expected to cut sod for the project, which is worth about $5 billion in June 2019, and Dr. Bawumia believes strongly the initiative will be a 'game-changer' in the Ghanaian housing market. UNOPS recently rolled out a $15 billion project to construct affordable houses in some countries in Africa, Asia and the Caribbean. Ghana and Kenya are the beneficiary countries from Africa while India will also benefit from the project in Asia. Ghana, with an estimated housing deficit of over two million, which is projected to increase to 2.2 million in a few years, will receive $5 billion to construct about 100,000 affordable houses. UNOPS is working in partnership with Sustainable Housing Solutions (SHS) to roll out the project which comes under the Sustainable Development Goals (SDGs) of the United Nations (UN). The partnership would see UNOPS and SHS delivering 260,000 plus high-quality affordable homes across the selected countries. Ghana's agreement was signed in September 2018 in New York, US, on the sidelines of the UN General Assembly which was witnessed by President Akufo-Addo. The new partnership will also explore new opportunities in the renewable market, with UNOPS expected to work with MYRA-SHS Energy, a subsidiary of SHS, which focuses on investments in renewable energy projects and associated infrastructure. It's the latest step in the UNOPS Social Impact Investing Initiative (S3I), which aims to attract financing from the private sector to develop projects in emerging markets. The technology is earthquake and hurricane resistant and constituent with the utilization of renewable energy and non-toxic insect-repellent properties. The concept aims at providing a 'turn-key solution' to reduce the current shortfall of tens of millions of decent dwellings.